When decorating the top of an armoire or chest, you first need to determine how much space you have. You will need to know, not only how much flat surface you have to work with but also how much vertical space you have. You also need to account for any “drop” that exists from the top of the trim down to the surface where your accessories will sit. Once you determine the drop, you will need to decide if you want to work with the drop, or eliminate it. In my case, I effectively eliminated the drop by placing old text books flat on the surface to raise the surface even with the trim on the armoire. If you do this, be careful to not go above the edge of the trim. You will definitely not want to books to show. Now that you have determined your available area, armed with a tape measure, it’s time to shop. When selecting your items, add interest by incorporating different textures as well as different colors. You will also want to vary the height of the items you select, selecting some within a few inches of your max height available, some a foot or less, and some in between. 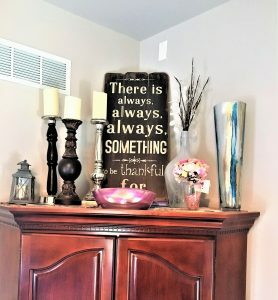 For my armoire I chose modern finishes on some classic pieces, a very trendy reclaimed wood sign, a couple of vases in interesting colors and shapes, and one very sentimental item. I found the sign at Michaels, the silver candlesticks at Home Goods, the solid wood candlestick was one I already owned. The pink bowl and the blue, white, and gold vase came from Home Goods, the white jug is from Target, and the lantern is from Michaels. The flowers and crushed gravel in the small clear vase were both from Michaels and the vase itself was a gift from my son when he was in Pre-school – that’s why it still has the card attached! The candles are flameless candles from Michaels that include a timer which allows them to “burn” for 3 hours each evening. I placed fairly lights, also on timers, in both the white jug and the blue, white, and gold vase. The branches in the white jug are also equipped with light,s again on timers coming on for 3 hours each evening. All of the lights other than those in the white jug are the color of natural candlelight, however, those in the white jug are more of a LED color. Because of this color mismatch, I have the timers set to come on at two different times. And even though this mismatch was an accident, I really love it because the arrangement has completely different looks depending on which light sets are on at the time.